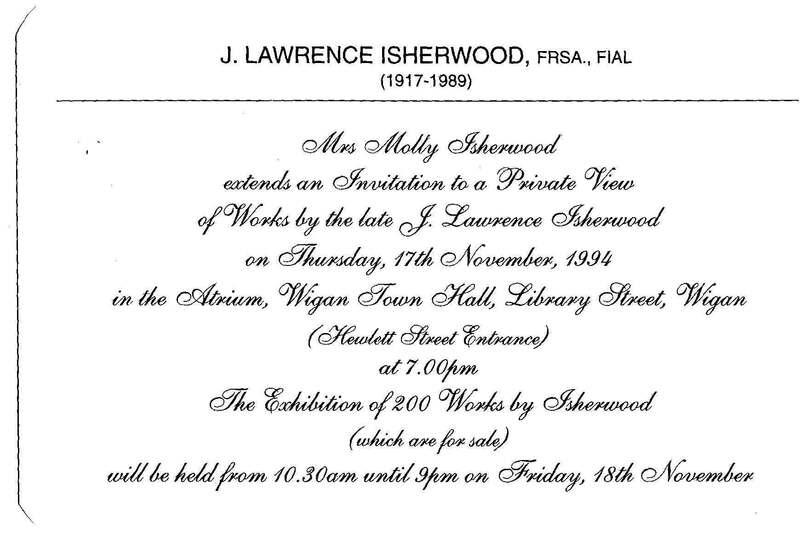 No-one knows more about the late James Lawrence Isherwood than Molly Isherwood, his sister-in-law. 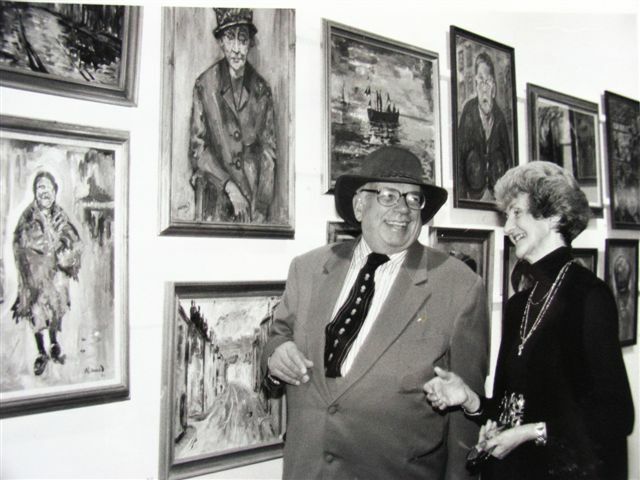 She knew him as a close family member for half a century and since his death in 1989 she’s made it her ambition to promote his work and ensure that he wasn’t a forgotten genius. Her husband Gordon and Jim were close brothers – yet the two men were totally different in temperament. Jim was fiery and often blowing his top. Gordon was relaxed and took life in his stride. Gordon, who was younger than Jim, and Molly always let Jim get on with his artistic life and supported him where they could. Shortly after his death the family allowed two non-selling shows, one at Wigans’s History Shop and in Stockport. 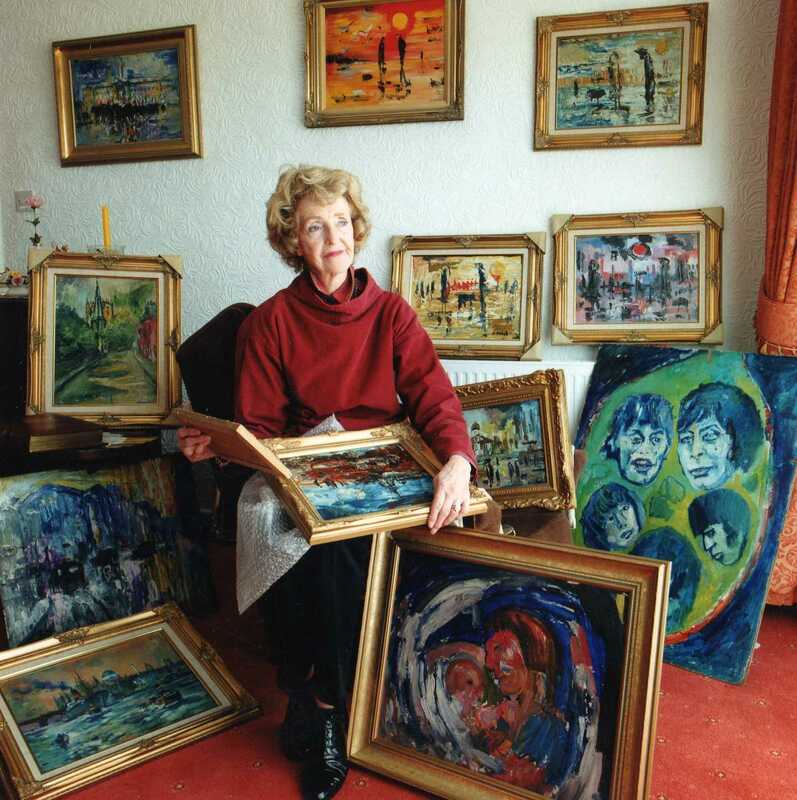 Gordon’s health was deteriorating and after a long illness, he died, leaving Molly alone in the world and wondering what to do the paintings taken from Jim’s home on Wigan Lane. 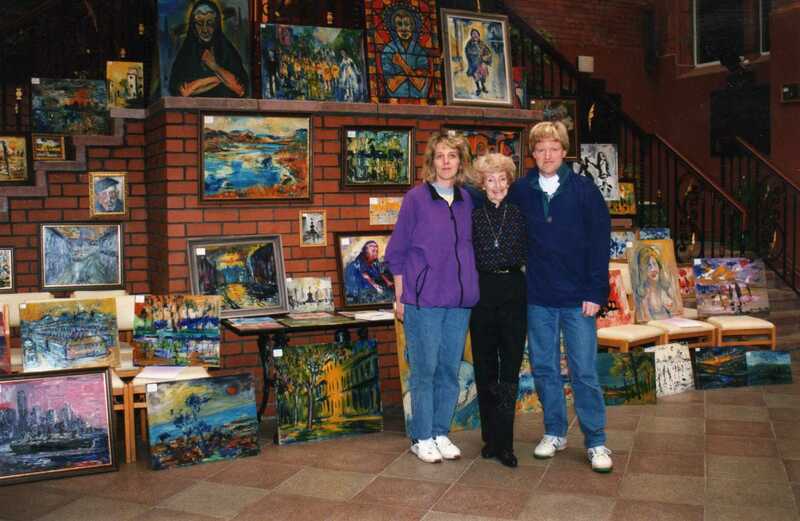 Molly realised she was entering a very different world when, in the early 1990s, she organised an exhibition of her brother-in-law’s work at Wigan Town Hall, assisted by her son Clive, daughter-in-law Marguerite and local journalist and art lover Geoffrey Shryhane. They looked at history – and wondered if there would be any buyers. In fact, on the day the show opened, crowds flocked to the Town Hall, and almost blocked the traffic. Police advised that the show open early to clear the people from the streets. 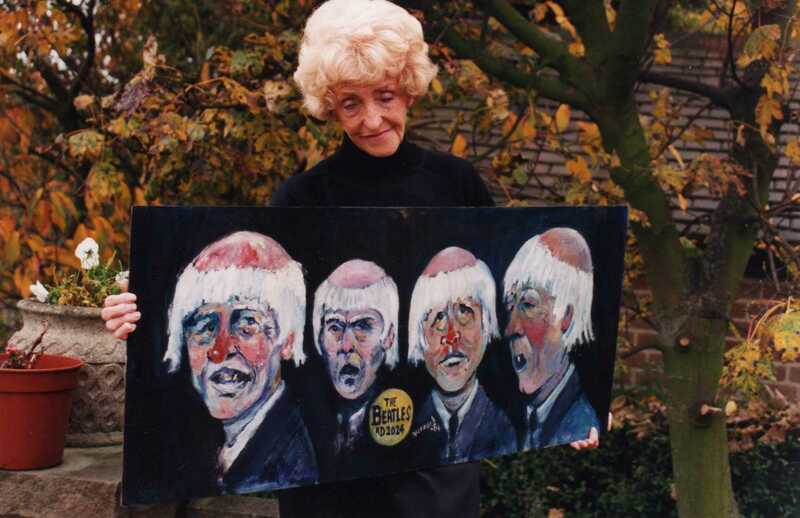 Several other shows followed in both Wigan and Southport and all were resounding successes and Molly and her family knew they had ensured Jim’s paintings had taken their rightful place in the world or art. But how did Molly come to meet Jim in the first place? She explained: “I met both Jim and Gordon by chance after the war, and recall their wonderful laughter and senses of humour. They were members of Wigan Rowing Club. A relationship developed between Gordon and me and between Jim and Florence. That friendship developed into romance. I was only 16 when plans were made for Gordon and me to get married. It was ridiculous … fancy thinking of getting married when were so young and earning just four shillings a week? “Time went by and a double wedding between the four of us was arranged. Special licences had to be obtained and a lot of people came to watch at Wigan parish Church.Jim and Gordon’s parents Lily and Harry didn’t attend the wedding because Lily didn’t think Jim was ready for marriage. At first we shared a flat on Wigan Lane. Then Gordon and I got a place at Ince and Jim and his wife eventually ended up living with Lily and Harry. Not long after Florence saw a shop with living premises above. It seemed idea – Florence could set up her hair dressing business. But Jim even refused to go and see it, saying he was happy to stay living with his parents. He said his mother liked the arrangement. Needless to say Florence was utterly disappointed and after some thought, returned to live with her father and eventually left Wigan. “There was a lot of tension. You see, Jim didn’t want to work He couldn’t make himself get out of bed in the morning. So really the marriage couldn’t last because of his temperament. The truth was Jim wanted to live with his Mother. “Florence thought by leaving Jim, it would bring him to his senses, and indeed Jim used to visit her as though they were still courting instead of being married. Jim didn’t want a divorce, but eventually it was inevitable, but he told people it was not his fault, but really it was. “He had as far as I know a condition called neurasthenia – an inability to make a decision. It haunted him all through his life.